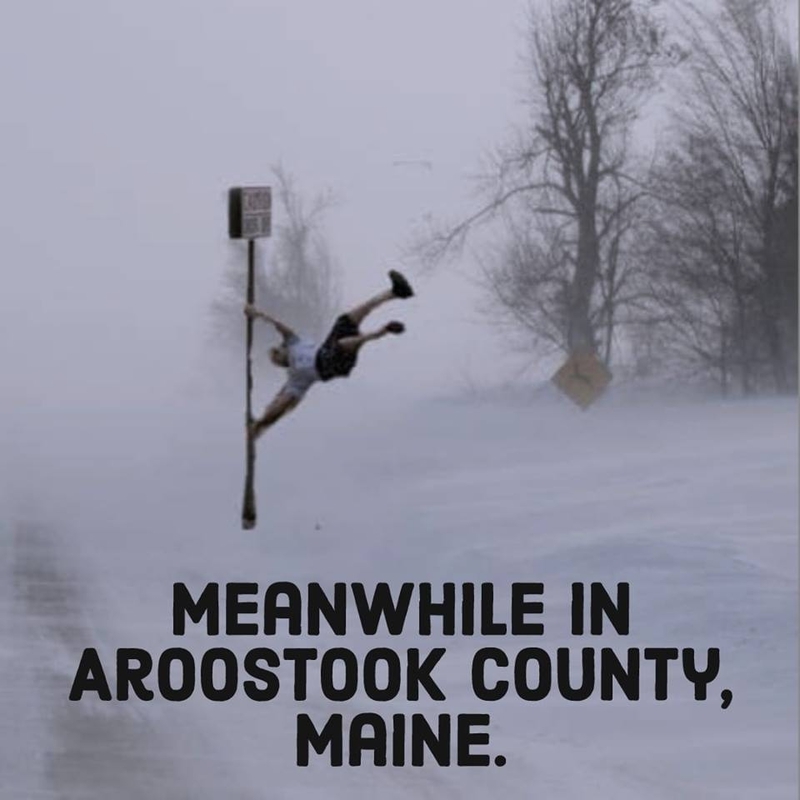 Aroostook County has been hit with fierce winds and blowing snow the past couple days resulting in many roads being closed and many accidents. 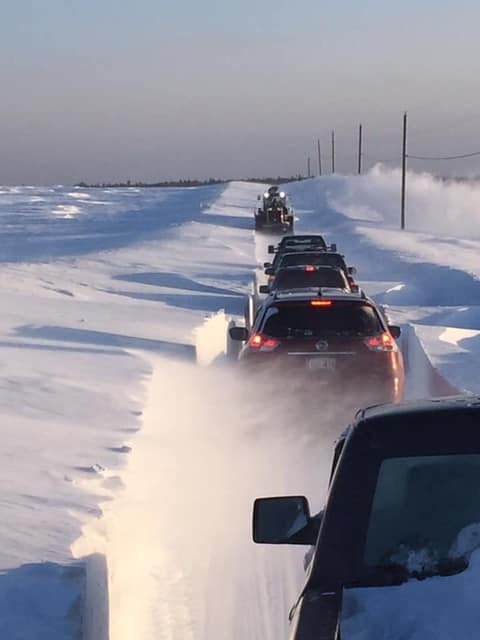 Vehicles line up single file behind snow clearing equipment through a drifted road in Grand Falls, NB. 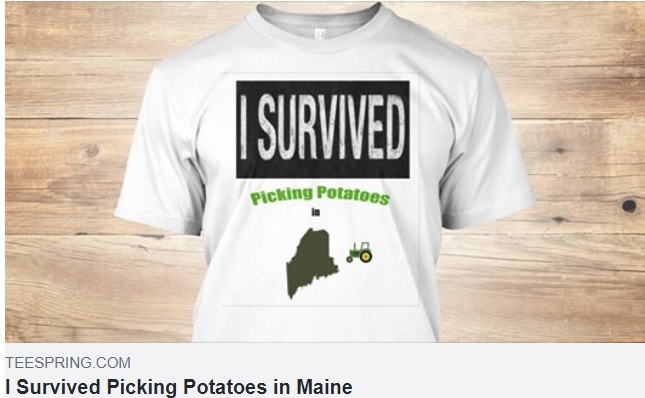 Aroostook County Speed Bumps aka buried road. 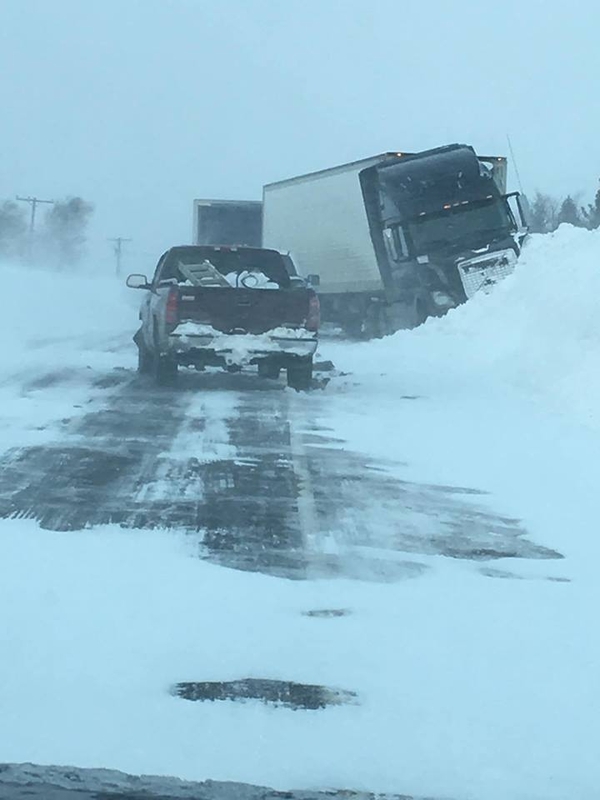 Snow related accident in Caswell yesterday. Nobody was hurt. Blowing snow on the Centerline Rd. in Presque Isle on Tuesday. The road was closed but a few vehicles still attempted to pass. 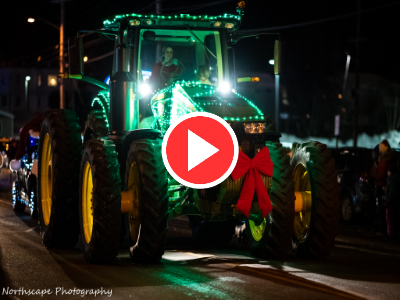 Take a few minutes and watch a slideshow of the annual Holiday Light Parade in Presque Isle! The parade took place on December 1st, 2018 on Main St. and included brightly decorated trucks, floats and more. Turn on your sound to hear soothing Christmas music as you watch. The slideshow contains 224 images! December 27, 2018 -River View in Fort Fairfield. December 24, 2018 -Christmas Tree made of books and sunset at the Presque Isle Public Library. October 23, 2018 -River sunrise in St. David, Maine. October 22, 2018 -River sunrise in St. David, Maine. June 21, 2016 -Dandelion Fuzz and Fuzzy Clouds in Presque Isle. June 9, 2016 -Barn in Dyer Brook. June 8, 2016 -Kids dancing around the May Pole during last year's Midsommar Festival in New Sweden. February 27, 2016 -Old Barn and Potato House behind maple trees. February 26, 2016 -Red Farm Building in Fort Fairfield. February 24, 2016 -Old Barn on the Center Limeston Rd in Fort Fairfield. 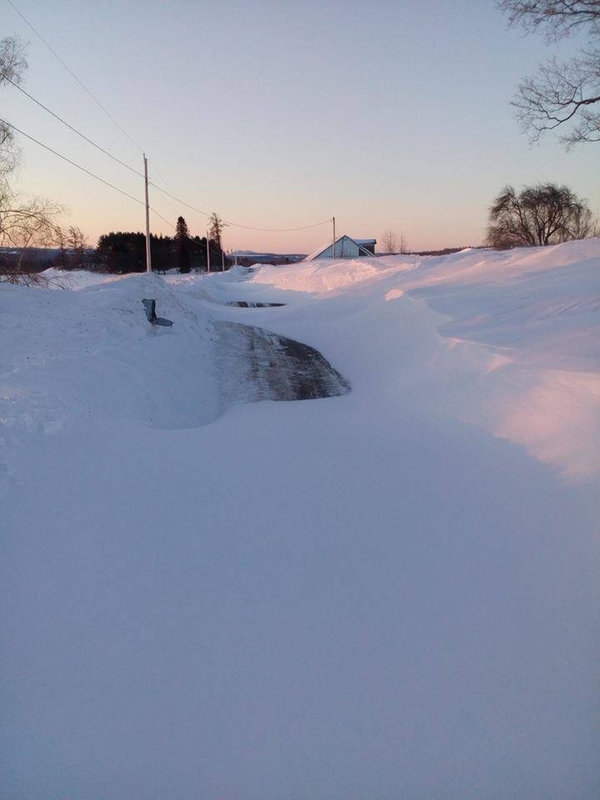 February 18, 2016 -Farm on the Parkhurst Siding Rd in Presque Isle. February 16, 2016 -Mapleton Barn. February 15, 2016 -Barn on the Hughes Rd. in Mapleton. Barn has now fallen down. February 10, 2016 -Amish farm on Rt. 163 in Easton. February 9, 2016 -Fort Fairfield farm landscapes. February 8, 2016 -Farm on the Brewer Rd in Presque Isle in Black and White. February 6, 2016 -Abandoned Barn on the Center Limestone Rd. in Fort Fairfield. February 5, 2016 -Old Potato House in Fort Fairfield. February 4, 2016 -Sunset and a country rd. north of Presque Isle. October 30, 2015 -Bright orange Tamaracs in a muted landscape in Easton. October 26, 2015 -Long Exposure of an old farm shed in Fort Fairfield. October 22, 2015 -360 Panorama on a hiking trail at the Nordic Heritage Center. October 20, 2015 -Foliage: Hiking trails in Presque Isle. October 14, 2015 -Foliage: Aroostook Farm, Mantle Lake Park and the old sanatorium in Presque Isle. August 8, 2015 -360 Interactive Panorama shot in the middle of a field of potato blossoms. Turn up your sound to hear "Wonderful World" in the background! July 29, 2015 -Northern Maine Fair: Pig Scramble, Motorcycle Jumping, long exposure shots in the Midway, etc. July 26, 2015 -Loring Land Speed Races and sunset behind a field of grain in Mapleton. July 24, 2015 -Saint Denis Church in Fort Fairfield. July 23, 2015 -Pig on an Amish farm and misc sunset pics on Fort Fairfield. July 6, 2015 -Sunset at lake Josephine in Easton. Old John Deere tractor on the Conant rd. June 19, 2015 -River crossing mural in Fort Kent. June 18, 2015 -Amish families from all over Aroostook gathered in Fort Fairfield for a barn raising. The whole thing took only 8 hours! June 15, 2015 -Installaton of the 50 Turbine Wind Farm in Oakfield has begun. April 26, 2015 -Land Speed Races at the former Loring Air Force Base in Limestone, Maine. April 22, 2015 -Foggy morning at the James School and Arnold Brook Lake in Presque Isle. April 21, 2015 -Spring birds are getting some color. April 18, 2015 -Sunset at the Aroostook River bridge, US Route 1 in Presque Isle. April 13, 2015 -Canada Geese and ducks in Presque Isle and a cemetery in Woodland. 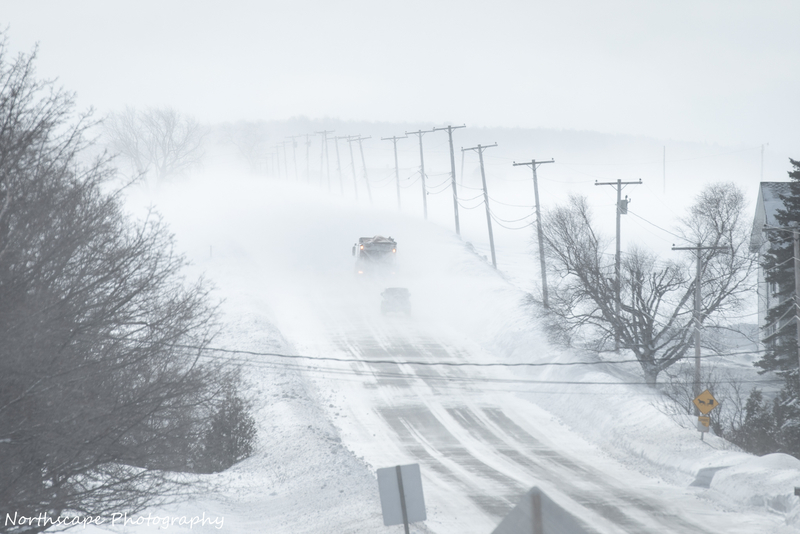 March 27, 2015 -Fort Fairfield Earlier Today: Public Library, Block House, Community Bandstand and Main St.
March 23, 2015 -Blowing snow engulfs cars between Presque Isle and Easton. March 19, 2015 -Barn and Homestead in Washburn, old farmhouse on the Green Ridge Rd. in Presque Isle, Ashby Rd. in Presque Isle. March 18, 2015 -Gray Squirrel, Clearing the roads and a weathered barn in Washburn. March 17, 2015 -Red quonset buildings add contrast to the landscape in Washburn.